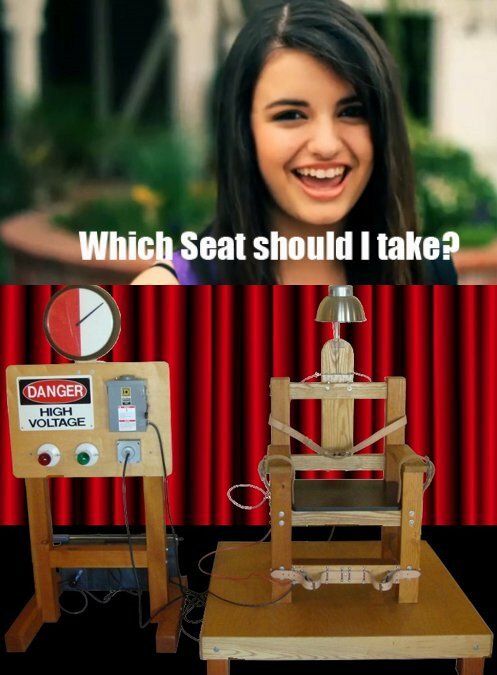 In case you weren’t paying attention (or were distracted by, I don’t know, important things) Rebecca Black has become something of an internet sensation. The short story: Rebecca Black’s mother paid a company $4000 to produce a music video for 13 year old Rebecca, which was then released on Feb 10 2011. It received a thousand YouTube views in the first month and around 87 million in the second. Yes, those numbers are correct. (If you watched it) did you catch all that? Obviously terrible lyrics, auto-tuned to hell & back, and what are thirteen year olds doing driving anyway? The criticism quickly mounted, and the song instantly became the most hated song on YouTube (1.7 million negative votes, and climbing). The great thing about six billion creative monkeys being clustered on a tiny rock is that you can always rely on them to be, well, creative. And create they did. Now, this is where the Rebecca Black story gets genuinely entertaining (rather than merely cringingly confusing). How about the censored version? Oddly, this make it all seem very much more appealing. Or if the song was interpreted by a (very) bad lip reader? Manages to capture the essence of the original quite effectively. which while unfortunately highlighting the banality of the lyrics, is actually quite a fantastic song. Or the most utterly disturbing (yet equally brilliant version) yet. Please do not, NOT let small children watch this (it won’t embed, unfortunately). Ok, enough of this. If you want more, search YouTube, there are currently 22,000 (yes, thousand) videos variously mocking, praising, reproducing or otherwise dissecting her song. Yes, all created in the last month. Oh human monkey people, you’re so awesome.